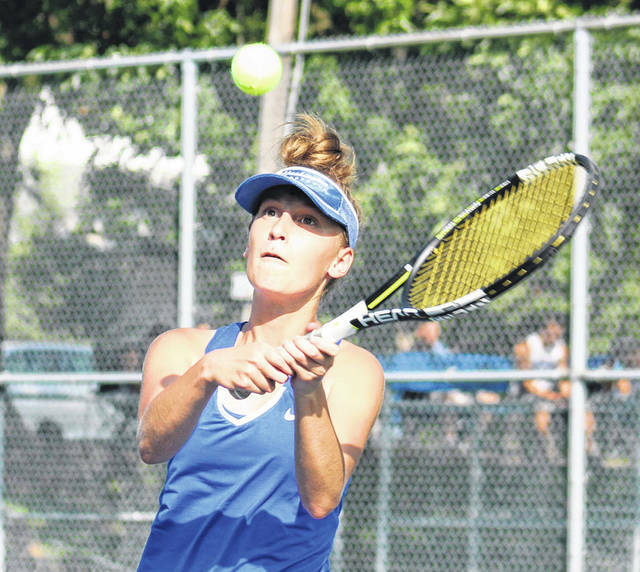 Brooklyn Foose eyes the return in her third singles match for Washington against Logan Elm Monday, Aug. 27, 2018 at Gardner Park. On a hot Monday, Aug. 27, the Lady Lion tennis team hosted the squad from Logan Elm High School. Washington remained undefeated with a 4-1 win over the Braves. At first singles, Megan Downing defeated Keller Clouse, 6-0, 6-1. At second singles, Jennifer Richards lost to Maci Garrett, 1-6, 2-6. Brooklyn Foose beat Ella Bennington on the third singles court, 6-0, 6-3. Beth Wilt and Sydnie Hall beat Kara Lutz and Mattie Smith, 6-0, 6-2. Brynne Frederick and Payton Maddux trailed 1-4 in the second set and came back to win, 6-3, 7-6 (7-4). On Saturday, Aug. 25, Washington traveled to Wilmington and competed in a 8-team tournament featuring Wilmington, West Clermont, Little Miami, Kings, De Sales, Miami Trace, Washington and Lebanon. Megan Downing placed second overall in the first singles bracket losing a 3-set match to Columbus De Sales. Brooklyn Foose won the third Singles bracket defeating De Sales in the championship match. Washington is at Greeneview Wednesday and Miami Trace will host Wilmington Wednesday, Sept. 5 at 4:30 p.m.
https://www.recordherald.com/wp-content/uploads/sites/27/2018/08/web1_Brooklyn-Foose-LL-10us-8-27-2018.jpgBrooklyn Foose eyes the return in her third singles match for Washington against Logan Elm Monday, Aug. 27, 2018 at Gardner Park.